← Break glass in case of adventure? There are many different advertising techniques employed by marketing teams from a multitude of companies. They spend millions of dollars every year to get their product in your mind. Why? Because there is money to be made from you. Everyday we see TV commercials, radio advertisements and magazine advertisements, not to mention the countless billboards lining our roads. Their aim is to use combinations of colors, sounds, images, songs and words to get your attention and get you thinking about what they’re selling. I’m going to be analyzing a magazine advertisement ran by the Tag Body Spray company. There most popular advertisements are that of the young guy innocently applying Tag Body Spray in the interest of possibly increasing his chances of meeting a girl. Little does he know shortly after applying Tag Body Spray, he will be pounced upon by hoards of young attractive girls hell bent on removing his clothing. Then, at this point, there will be a freeze frame of the image of the guy being attacked. Whap! A warning label is slapped on the screen and under it is a comical disclaimer stating the hazards of applying Tag Body Spray. It warns that the Tag Body Spray company will not be held accountable for any female attention received by the user. This is extremely similar to the advertisement I selected with some minor differences. Since it is a picture advertisement, it is only the freeze frame shot with the warning label and disclaimer. However it carries the same message. We see a young guy being pinned to the floor of an indoor volleyball court by an entire women’s volleyball squad full of young attractive girls. There are mixed expressions on all faces pictured. They young male victim has what is supposed to be horror and agony written on his face but under closer inspection it proves to be an almost happy sort of anguish. Some girls just look extremely ferocious, air born and poised in positions imitating lions of the African savannah, while others look carefree and happy to be committing assault and battery. The original ad i made had word art written into the picture reading, “Warning, As with all men’s body sprays, you are definitely more likely to get tackled by dudes then hot chicks” but technology sux! and try to imagine a little can of Tag Body Spray. Advertising by some companies is used to try to attain many things. In some cases, they are merely trying to get you to see how great the product is or how much better your life could be with the product or even how much you may need the product just to survive. However, other companies advertise to distract you from the negative aspects of the product. This is the case with cigarette companies and in some cases alcoholic beverage manufacturers like beer companies and liquor companies. Although its highly prevalent in companies selling dangerous products it is not exclusively used by them. Sometimes the ads are used to make you forget what you know about the product from experience. This is the case with men’s body spray companies. All their commercials involve women being extremely attracted to the user of these products. This is contradiction to the truth that most women don’t like the smell of these popular body sprays. So why do guys buy them? They buy them because the advertisements have convinced them that this isn’t so, that women will fling themselves at you if applied correctly. My Anti-Ad is a parody of the Tag Body Spray theme of advertisement. In most of their ads there is a young guy being savagely attacked by throngs of women madly trying to take his clothes off followed by a comical warning and disclaimer. My parody ad is of a scene of a football play being ended by the ball carrier being dragged to the ground by the opposing team. This is in reminiscent fashion of the Tag Body Spray commercials except it is the reality of the actual product use. Athletes who use Body Spray are more likely to be in aggressive physical contact with other men then with women. 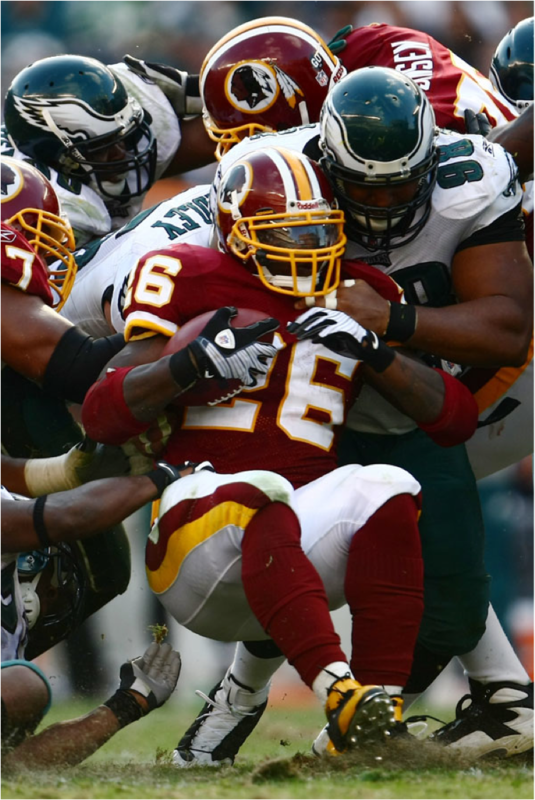 In my ad, we see a Washington Redskins football player being forced to the ground by several Philadelphia Eagles football players. I have applied a strong Warning label just like the Tag commercials. I have also applied a disclaimer that reads, “As with all men’s body sprays, you are definitely more likely to get tackled by dudes then hot chicks.” In the lower left hand corner I have placed a spray can of Tag Body Spray. At first glance this would instantly register in your mind as a Tag Body Spray commercial but once more closely observed, it is found that this is a parody. 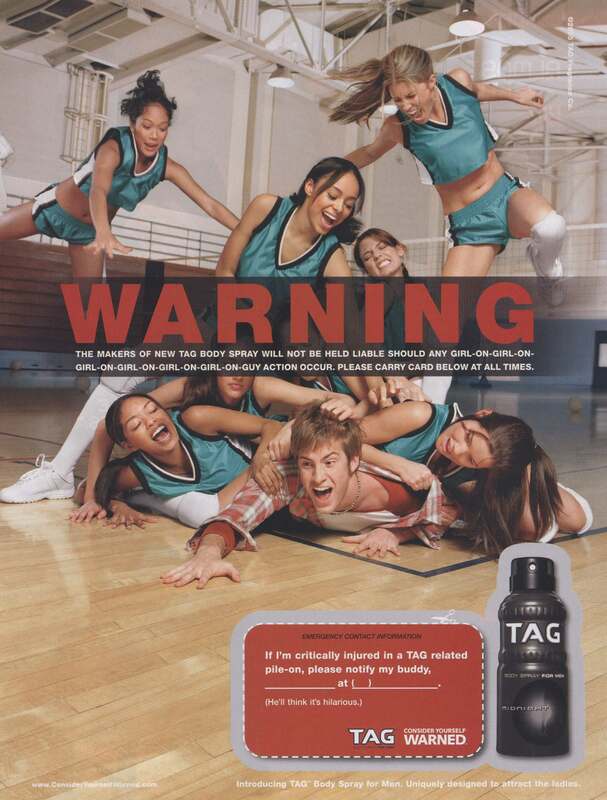 While in the original advertisement, the guy being victimized might enjoy it, in the more realistic and parody version, the most likely of victims is an athlete being forced out of play by the opposing team.